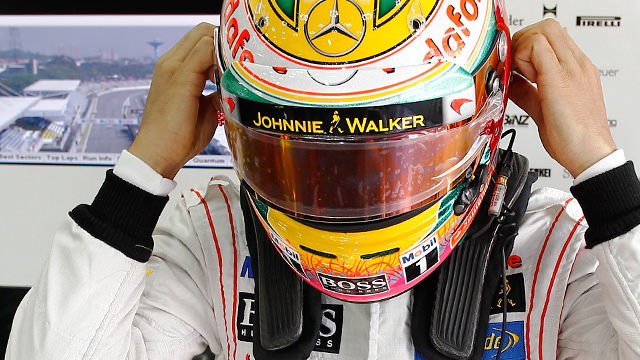 This is F1Minute - Lewis Hamilton leads both practice sessions in Brazil. The final race weekend of 2012 is underway, with two Free Practice sessions complete at the Interlagos circuit. Lewis Hamilton led the way in FP1 but only marginally, with the gap to second place Sebastian Vettel just nine thousandths of a second. Mark Webber was just behind in third. HRT ran for only half an hour of the session, whilst Kimi Räikkönen was restricted by a reported engine problem, completing 16 laps. Felipe Massa was running a new helmet design for his home race, whilst Bruno Senna, also at his home event, was replaced by Valtteri Bottas in the morning session. The top three remained the same in the afternoon, with Hamilton leading Vettel then Webber. The gap was increased to two tenths of a second though. Massa struggled through a few spins, whilst Charles Pic brought his Marussia to a halt out on track with a suspected alternator failure. HRT continued their limited programme, with just 58 laps between all four drivers all day.